UKIP has come under fire after it emerged that seven people were arrested on suspicion of immigration offences in a raid on a restaurant owned by the party's small business spokesman. In June, the authorities raided a premises in Manchester set up by Amjad Bashir - who is standing for UKIP in this month's European elections. His family have denied any wrongdoing. UKIP said the restaurant was appealing against likely fines, saying visas and passports may have been forged. 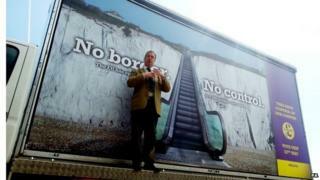 UKIP, which is aiming to top the polls in the European elections on 22 May, has long criticised what it calls the UK's "open borders" immigration policy. The party, which wants to leave the European Union, has called for a crackdown on illegal immigration and strict curbs on the number of legal migrants allowed into the UK every year. The Times, which first reported the story, said that three days after the raid Mr Bashir resigned as a director of the company, which owns the Zouk Tea Bar and Grill in Manchester, and a sister branch in Bradford. However, it said he remains a shareholder and has continued to take a role in the running of the restaurant, co-founded with his two sons Tayub and Mudassar. Mr Bashir, 61, is second on UKIP's list of candidates for the Yorkshire and the Humber region in this month's European elections - giving him a realistic chance of being elected. On his website, Mr Bashir said he joined UKIP because other parties were "neglecting the needs of the small to medium size businesses as well as their failure to tackle mass immigration". The Home Office confirmed seven people were arrested "for a variety of immigration offences" and a civil penalty notice was served after the raid. Tayub Bashir told The Times that they were appealing against the notice and had not yet paid a fine. He said the restaurant conducted immigration checks on all employees and vigorously denied any wrongdoing. Liberal Democrat MEP for Yorkshire and the Humber, Edward McMillan-Scott, told The Times: "Forget the obvious hypocrisy; employing illegal immigrants is exploitative and against the law." But Mr Farage said he was not going to prejudge the outcome of the legal process. "His son is the director and runs that business and they had an argument and a row with the immigration people which they are appealing," he told the BBC's This Week programme. UKIP later insisted that Mr Bashir has resigned as a director before the raid took place and the restaurant carried out rigorous passport and visa checks before taking on new staff. It said three of the seven workers who were arrested were subsequently found to be entitled to work. Of the remaining four, the party said the company was appealing against fines in two cases where it believed the workers' paperwork was valid and believed there were mitigating circumstances in the other two cases. It says two workers temporarily hired to fill in for unexpected vacancies on a Saturday night - who were not known by Mr Bashir - may have provided forged documents.